Since the surprise critical and box-office success of his alien refugee thriller District 9, everyone's been really eager to see what writer/director Neill Blomkamp would follow it up with. 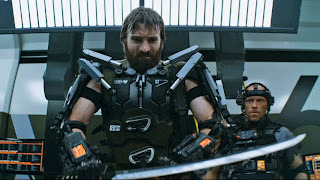 There were a few months where his name was suggested for every big-budget sci-fi franchise imaginable until it was announced that Blomkamp had admirably chosen to develop his own material, with the result being Elysium, a film that again finds him using sci-fi to comment on a modern social issue, with similarly exciting, if clumsier results. Blomkamp's script projects a future where overpopulation and lack of resources have transformed Earth into a planet-wide third-world nation. Jobs are scarce, medical care is inadequate and everyone struggles to survive day-to-day. 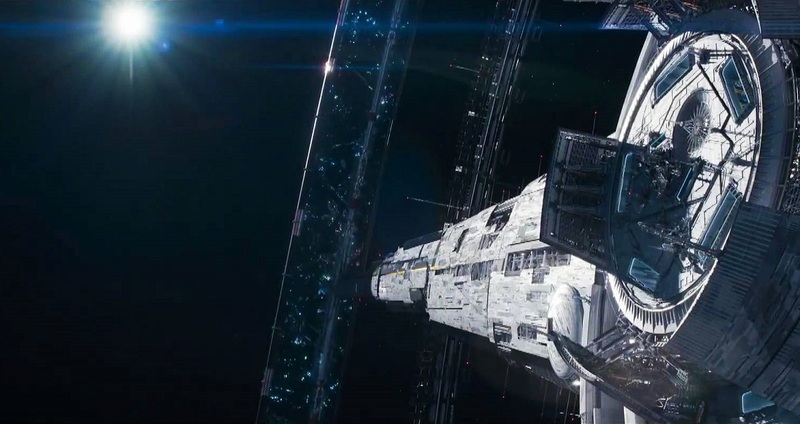 The situation is different on Elysium, a giant ring-shaped space habitat hovering tauntingly in the sky over the oppressed masses. Here, the rich and elite live in comfort and perfect health, happily ignorant of the problems below. As a child, Max (Matt Damon) dreamed of someday making something of himself and living on Elysium. As an adult, he's barely able to keep his job as a factory worker in a robotics plant. 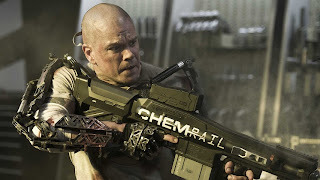 But when an industrial accident douses him with a lethal dose of radiation, he has only one chance to survive: to somehow sneak aboard Elysium and use their superior medical facilities. To do so, he returns to his criminal roots to participate in a heist, one which leaves him in possession of a valuable piece of data sought by Elysium's ruthlessly ambitious defense secretary (Jodie Foster) and which will make him the most wanted man on Earth. Science fiction has always been a vehicle for commentary on the social divide, going back the works of H.G. Wells and continuing right up to The Hunger Games trilogy. Unsurprisingly it's also been a staple of sci-fi cinema ever since Metropolis back in 1927 but it's a subject that's difficult to tackle without being heavy-handed, as unfortunately proven here. Those who thought the Apartheid metaphor of District 9 was too obvious will have plenty of reasons to be disappointed with Elysium, as Blomkamp sets up his world with very little subtlety. He delivers when it comes to smaller details about the people and technology that populate it, from the subtle accents and facial markings that mark the Elysians to the endless favelas that comprise the desolate Los Angeles of the future. What's oddly missing are the broad strokes of how the social and political systems depicted would work. 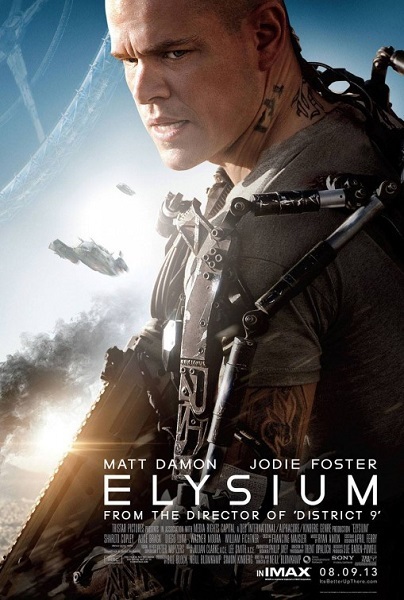 We're never totally sure how Elysium itself directly relates to the Earth below. The first assumption would be that those holding political power on Earth would live on Elysium but the habitat seems to be its own sovereign state with its own president and a specific definition of citizenry. Meanwhile the Earth below presumably has some form of government since it has police and a parole system, but since everything we see of these are automated, there's an implication that the duties of maintaining order have been completely put in the mechanical mitts of snarky machines, except when Elysian citizens are involved. This lack of clarity and deeper thought regarding the set-up makes the whole film feel more like a simplistic parable than an astute portrait of social inequity, especially after the relatively unnecessary opening scenes in which a young Max is given information about both Elysium and the film's social messages through such on-the-nose exposition that it feels like Blomkamp's speaking to the audience as though we were children as well. To his credit, Blomkamp seems to realize that the metaphor he offers is too broad to be dealt with in its entirety and keeps the focus of the film on the issue of health care, or more specifically, an illegal form of medical tourism in which L.A.'s criminal element make risky smuggling runs ferrying the impoverished sick to Elysium to use their advanced medical technology. But even this specific plot thread lacks nuance; the intruding ships are identified by Elysian security as 'undocumented,' exemplifying the blunt manner with which the political message of the film is delivered. Where Blomkamp shines is his ability to build an exciting adventure around the social commentary. Like James Cameron, he possess enough directorial skill to help the audience get past thin scripting and characters, at least while the movie's going, and to make the plot mechanics and action gripping. He's also great at creating a visually immersive world, showing us an oppressed Earth that doesn't aim for the trashed romantic grandeur of the dystopian environments seen in Blade Runner or The Matrix but functions as a convincingly depressing slum. On the opposite side of the economic divide, the gleaming pastoral beauty of the habitat itself emerges as probably the closest we'll ever get to seeing Larry Niven's Ringworld on a movie screen. Meanwhile, the technology on display, which includes strength-augmenting exo-skeletons, civil servant robots, sleek vehicles, and colorfully gruesome weaponry, is all meticulously designed and photographed with a startling versimilitude. Unfortunately the thematic simplicity bleeds into our protagonist as well. Matt Damon is an inherently likeable screen presence and given the problems we see Max facing, we are on his side from the outset. Although we are told he's had legal troubles in the past through his former career as a car thief, we are introduced to him as a decent guy forced to swallow a ton of everyday injustice, whether it's being searched and assaulted by robotic cops for no reason or facing unsafe conditions in the workplace, and being expected to like it. When he's callously told that he's going to die and given nothing but a few pills to keep him functional, we share his righteous anger and nothing-to-lose desperation. Thus it's a bit disappointing that at the mid-point Max is suddenly saddled with the familiar character arc of overcoming his self-interested goal to serve the greater good, personalized in this case by his childhood friend Frey (Alice Braga), who wants Max to help save her terminally-ill daughter. While it helps that Braga is fine at engaging our sympathies in the role and isn't reduced to being Max's love interest, but this is one occasion where I think letting the hero remain focused on keeping himself alive would have been sufficient to get the message across without turning him into a reluctant savior figure. At least the metal exo-suit he has grafted onto his failing body to keep himself going doesn't become the focus of the story. Given Blomkamp's clear affection for futuristic toys, it would be very easy for the film to become about Damon's gadget rather than allowing the suit to simply be a tool that gets him through the story. 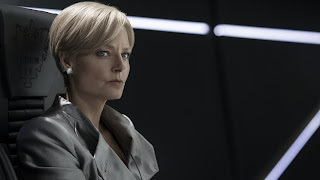 Representing the inhuman 1% is Foster as Jessica Delacourt, Elysium's Rumsfeldian secretary of defense who has an almost pathological distaste for the unwashed masses and has no compunctions about blowing up a ship full of women and children if it keeps them from setting foot on her pristine paradise. As the rest of Elysium's ruling cabal express their disapproval with her methods, she seems motivated by the self-important conviction that she is the only barrier between Elysium and the chaos of the world below. Foster's controlled cruelty brings to mind her icy troubleshooter from Inside Man, enhanced with a subtle accent (the movie one-ups After Earth when it comes to futuristic dialects) and a militarized ruthlessness. But something's missing. Delacourt seems intended to personify the concept that massive overpopulation has caused the value of individual human lives to drop even further in the view of those in power. But there's a viciousness to her that goes above and beyond her fellow Elysians, to the point where we feel there's some key aspect of her character that has somehow gone missing over the course of the story. This discrepancy cuts even deeper following a decision she makes in the third act that seems to run totally contrary to the character as she had been presented to that point. Character motivation gleefully leaps right out the window when it comes to Kruger (Sharlto Copley) Delacourt's depraved and unstable operative. He's the type of villain whose sole bit of characterization is that he's insane, but as brought to life by Copley, gnawing his way through his second teaming with Blomkamp, it's enough. It's fun and not a little startling to see him swing so far from the timid bureaucrat he played in their previous outing together to become a grimy, animalistic monster who enjoys the bloody perks of his job way too much. Armed in a better exo-suit than Max's and unpredictable to the point where any moment he's onscreen has the potential for violence, he's a great adversary and gives the movie some welcome energy as things get complicated. We get a few nice supporting turns as well from the very busy William Fichtner, again nearly unrecognizable as the snooty executive of the robotics firm where Max is employed. Diego Luna, cast here as Max's pal and criminal co-hort Julio, is always a welcome presence while Wagner Moura has a nice turn as Spider, a jack-of-all-trades gangster/revolutionary who's motivated as much by the chance to mess with the system as he is money. With hype levels raised to rapid peak after Blomkamp's freshman success, it's no surprise to find that Elysium is a bit of a let-down. In that sense, it's of a piece with most of the blockbuster fare we've seen all summer long. But putting aside its narrative shortcomings, the excitement and atmosphere that Blomkamp creates confirm that he is a talent to watch and the kind of filmmaker the sci-fi genre needs more of. Not a great flick, but still a very good one. Nice review Tim.